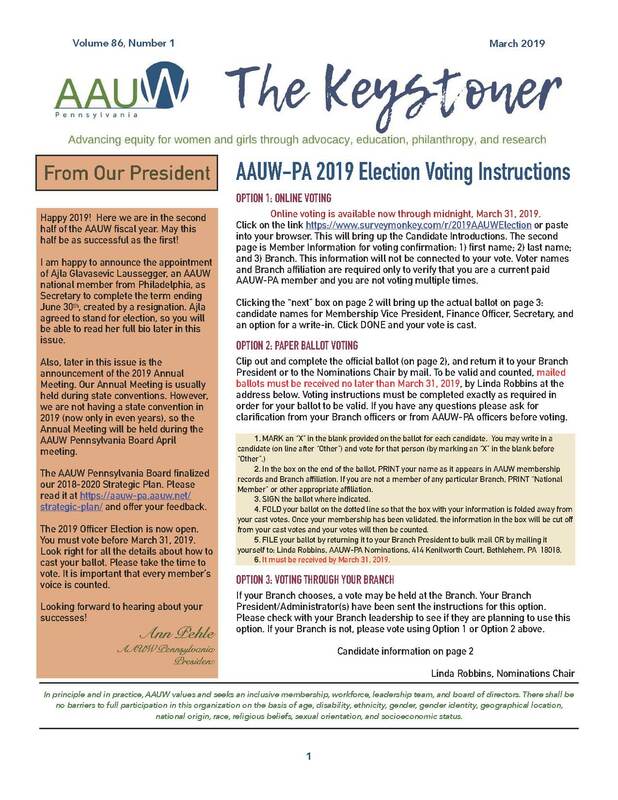 The AAUW-PA Board of Directors is proposing several bylaw amendments to be voted upon by the membership at the Annual Meeting April 14, 2018 during Convention 2018. Several of these proposals are to accommodate separating the election of state officers from the state Annual Business Meeting. The state has been operating under a model in which there is an Annual Business meeting held each April at either a Convention or a shortened 1-1/2-day Annual Meeting, followed by an annual July Summer Retreat meeting. The board has decided to move to a one state meeting a year format alternating Convention with July Summer Retreat so that Conventions would occur in April in even-numbered years and the July Summer Retreat would occur in July in odd-numbered years. This causes an issue for election of state officers in non-Convention years. The board of directors is proposing that we separate the election of state officers from Annual Business meetings to solve this issue. To accommodate this separation, some of our bylaws have to be amended. In addition to these proposed bylaw amendments, we took the opportunity to review the bylaws in total and are proposing a few other changes that will more accurately reflect the actual practice of the board of directors. Going forward the state Annual Business meeting in even-numbered years would occur during the April Convention and in odd-numbered years would most likely occur as part of a scheduled board meeting at which all members in good standing would be notified and invited to participate. Proposed changes to bylaws, proposed resolutions, and adoption of the state Public Policy Priorities business would only occur biannually at the April Convention Annual Business meeting in even-numbered years when an in-person meeting would occur. The bylaw current wording, proposed amendments, and rationale for the changes are listed below. You can download a copy of the Proposed Bylaw Amendments here. Below are proposed amendments to the AAUW-PA Bylaws to be voted upon at the Annual Meeting April 14, 2018. Deletions are strike through and additions are underlined. Section1. Nominations part a. a. There shall be a Nominating and Elections Committee composed of a Chair from the Affiliate board appointed by the president with board approval at the first meeting of the fiscal year plus a representative from each district in the Affiliate, elected at the Affiliate annual business meeting. One member and two alternates not currently serving on the Affiliate board of directors shall be elected by the members from each district as designated by the board of directors. a. There shall be a Nominating and Elections Committee composed of a Chair from the Affiliate board appointed by the president plus a representative from each district in the Affiliate, identified by the District Coordinator of each district and submitted to the board of directors. The nominating chair is appointed by the President before the first meeting of the fiscal year. Annual Meetings in non-Convention years won’t offer an opportunity to elect Nominating committee members from the Districts, this appointment method offers an alternative. Section1. Nominations part b. b. Suggestions from the branches and/or individual members for nominees shall be submitted in writing to the chair of the Nominating and Elections Committee by the date established by the Affiliate board of directors. The chair shall report to the members of the committee all names received. b. Individual members or branches may nominate a candidate for election provided they acquire the written consent of the candidate and forward the information on the form provided to the Nominating and Elections Committee by the designated due date. Retains the ability for individuals and branches to offer nominees to the Nominating Committee; clarifies the method. Section 1. Nominations part d d. If no candidate is identified for an office in time to notify the membership one month prior to the Affiliate annual business meeting, the nominating committee may continue to seek candidates until the first day of the annual meeting. If a candidate is identified, the nominating committee will meet to approve the candidate and add the name to the slate for election by the membership at the annual meeting. Should no candidate be identified prior to the annual meeting, the Executive Committee will appoint someone at the first meeting of the newly elected board. d. If no candidate is identified for an office in time to be included on the ballot, the Executive Committee will appoint someone at the first meeting of the newly elected board. This allows for appointment of officers to the board that were identified after the official election ballot was set. Section 2 Elections part a. a. All elections shall be held at the Affiliate annual business meeting. All elections shall be conducted under the oversight of the Nominating and Elections Committee. a. All elections shall be held annually. All elections shall be conducted under the oversight of the Nominating and Elections Committee. Elections are proposed to take place separate from the state Annual Meeting since the format and timing of the state Annual Meeting will differ in Convention and July Retreat years. Section 2 Elections part b. b. Nominations may be made from the floor with the written consent of the nominee. Members voting by approved long-distance methods may write in the names of candidates of their choosing if they do not select a candidate whose name is already printed on the ballot. Written consent of the write-in candidate must be attached to the ballot when it is submitted or mailed to the Affiliate. None, Eliminate bylaw Elections may be held separate from an in-person state meeting so there will be no opportunity for nominations from the floor. Article X, Section 1d offers an opportunity for individuals and branches to nominate candidates prior to the election so the opportunity is retained. Section 2 Elections part c. c. All members are encouraged to vote in all elections of the Affiliate. To facilitate voting by members, a proxy voting system or voting by mail, electronic means or other long distance methods may be utilized, as they become feasible. Any voting method must be approved by the Board of Directors and functional at least 2 months prior to any meeting at which it will be used. b. All members are encouraged to vote in all elections of the Affiliate. To facilitate voting by members, voting by mail, electronic means or other long distance methods may be utilized, as they become feasible. Any voting method must be approved by the Board of Directors and functional at least 2 months prior to any meeting at which it will be used. For elections held separate from an in-person meeting there is no method to allow for proxy voting. Section 2 Elections part d. d. Elections shall be by secret ballot unless there is only one nominee for a given office in which case the election may be by voice vote. Election shall be by a majority vote of those present and voting either in person or by other approved methods, or by plurality if there are three (3) or more candidates for a position. c. Elections shall be by secret ballot, show of hands or voice (at an in-person meeting). Election shall be by a majority vote of those voting either in person or by other approved methods, or by plurality if there are three (3) or more candidates for a position. For elections held separate from an in-person meeting a voice vote cannot be taken. Section 1 Affiliate Officers part b. b. The appointed officers shall include officers fulfilling the functions of administrative director and public policy and such other functions as deemed necessary by the Affiliate executive committee, which functions may include AAUW Funds, Diversity, Younger Members, Branch Liaisons, C/U, Communications, and Conference Coordinator. b. The appointed officers shall include officers fulfilling the functions of administrative director and public policy and such other functions as deemed necessary by the Affiliate board of directors. Adding flexibility to the bylaw. These officers as well as others can be appointed but do not need to be delineated in the bylaw wording. In practice, the board appoints these not the Executive Committee. Section 2 Affiliate Officer Duties part f. f. All elected officers shall submit an annual written report to the president, board of directors, and members at the Affiliate annual business meeting. f. All elected officers may submit an annual written report to the president, board of directors, and members at the end of the fiscal year. In practice officers are not required to submit a report. Using the end of the fiscal year gives flexibility in the alternating model of meetings going forward. Section 2. Administrative Responsibilities part b. b. It shall act for the Affiliate between Affiliate annual business meetings. NONE, Eliminate bylaw This is the obvious purpose of a board and seems redundant. Section 2 Administrative Responsibilities parts c through f. c. The board may adopt rules to govern its proceedings. d. The board shall have fiscal responsibilities as outlined in Article XVI, Financial Administration, Section 2.
e. It shall approve the programs for Affiliate meetings. f. It shall approve the establishment of special committees and task forces. b. The board may adopt rules to govern its proceedings. c. The board shall have fiscal responsibilities as outlined in Article XVI, Financial Administration, Section 2.
d. It shall approve the programs for Affiliate meetings. e. It shall approve the establishment of special committees, working groups, and task forces. Renumbering of the remaining bylaws. Section 4. Meetings Section 4. Meetings of the board shall be held at least three times per year. Section 4. Meetings of the board shall be held at least two times per year. Allows state board to reduce the number of meetings to cut costs. a. Determine the standing and special committees necessary for the work of the Affiliate and recommend their establishment by the board. b. Confirm the appointments of all committees, task forces and appointed officers. c. Determine the time and place of the Affiliate annual business meeting, other Affiliate meetings and meetings of the board of directors. d. Make recommendations to the board of directors. e. Report to the board of directors on its activities and action taken. f. Fill a vacancy in any office except that of the president. a. Make recommendations to the board of directors. b. Report to the board of directors on its activities and action taken. c. Fill a vacancy in any office except that of the president. d. Accept and request resignations of board members. In practice, it is the Board of Directors not the Executive Committee that determines the committees, task forces, working groups, etc. and the time and place of Affiliate and board meetings. The rest of the amendments are just renumbering. Article XIII. Affiliate Executive Committee Section 3. Meetings Section 3. Meetings. The executive committee shall meet at the time of the Affiliate annual business meeting and at the call of the president; and at other times at the written request of two members of the committee, provided at least five days’ notice has been given to the members together with the agenda. Section 3. Meetings. The executive committee shall meet at the call of the president; and at other times at the written request of two members of the committee, provided at least five days’ notice has been given to the members together with the agenda. In practice, the Executive Committee does not routinely meet at the Affiliate annual business meeting. It rarely meets at all. This amendment will allow it to meet at the Annual business meeting or any time it deems necessary. a. Be the official representative of the branch in the activities of AAUW on all levels. b. Send to the president of the Affiliate the names and addresses of all officers and task-force and committee chairs no later than June 30.
c. Assume the responsibility to bring the branch bylaws into conformity with AAUW and Affiliate bylaws after each AAUW convention and Affiliate annual business meeting and submit them as instructed to the Affiliate bylaws chair before the December 1 deadline. d. Send to the Affiliate president a list of candidates for appointive offices together with a statement of their qualifications. e. Send annually to the Affiliate president the names of the designated branch contacts for administration and finance. f. Designate a member other than the contacts for administration and finance to record and make available upon request the minutes of each meeting and board meeting. Section 2. Branch Treasurer or Finance Officer. The branch treasurer or finance officer shall send Affiliate dues to the Affiliate finance officer, postmarked no later than August 10. Dues received after August 10 for late renewals or for new members shall be forwarded immediately. Section 3. Branch Officers and Committee Chairs. Branch officers, task force chairs and committee chairs shall make reports as may be required by a member of the Affiliate board of directors or by a special committee chair. Section 4. Property and Assets. The title to all property, funds, and assets of all recognized branches is vested in each of those branches for the joint use of the members, and no member or group of members shall have any severable right to all or any part of such property. Property and assets shall not be used for any purpose contrary to AAUW. In the event of dissolution of a branch or the termination of its affiliation with AAUW, all assets of the branch shall be transferred and delivered to AAUW or to an AAUW-affiliated entity designated by AAUW. None, Eliminate bylaw This information is part of the procedures of the Branch Officers and Chairs and does not belong in a bylaw. Article XVII. Meetings of the Affiliate Section 1. Annual Meeting Section 1. Annual Meeting. The Affiliate shall hold an annual business meeting. The purpose of the annual business meeting will be to conduct the business of the Affiliate, including but not limited to electing officers, establishing dues, reviewing the budget, amending bylaws, and receiving reports. The exact date, time, and place of the Affiliate annual business meeting shall be determined by the executive committee. Section 1. Annual Meeting. The Affiliate shall hold an annual business meeting. The purpose of the annual business meeting will be to conduct the business of the Affiliate. Election of officers is proposed to be separated from the Annual Meeting. Wording “conduct the business of the Affiliate” allows for flexibility in the agenda. Executive Committee does not determine the date, time and place, the board of directors does. Article XVII. Meetings of the Affiliate Section 4. Voting part b b. Votes for candidates for office in the Affiliate may be cast in person or by other approved methods as described in ARTICLE X., Section 2. b, c and d, of these Bylaws. b. Votes for candidates for office in the Affiliate may be by approved methods as described in ARTICLE X., Section 2. b and c, of these Bylaws. Elections may be held separate from an in-person state meeting so there will be no opportunity for in person voting. Changes in lettering to reflect change in Article X bylaw if passed. Article XVII. Meetings of the Affiliate Section 4. Voting part c c. Votes on amendments to these Bylaws may be cast in person or by other approved methods as described in ARTICLE X, Section 2c, of these Bylaws. c. Votes on amendments to these Bylaws may be cast in person or by other approved methods as described in ARTICLE X, Section 2b, of these Bylaws. Change in lettering to reflect change in Article X bylaw if passed. Article XVII. Meetings of the Affiliate Section 5. Meeting Rules Section 5. Meeting Rules. Affiliate annual business meeting rules shall be proposed by the Affiliate board of directors and considered by each Affiliate annual business meeting as its first order of business. Section 5. Meeting Rules. Affiliate annual business meeting rules shall be proposed by the Affiliate board of directors. Allows flexibility for Annual business meetings held in non-Convention years when no or a limited in-person meeting will occur. Article XVII. Meetings of the Affiliate Section 8. Quorum Section 8. Quorum. The quorum shall be 75% of the registered eligible voters attending the annual meeting. Section 8. Quorum. The quorum shall be a majority of the registered eligible voters at an election event (branch meeting, electronic voting, paper ballot voting, or other Board of Directors approved method of voting) who cast a vote. Adjustment to accommodate Elections held separate from in-person meetings. The current AAUW-PA Bylaws in their entirety can be found here.